Of late, I’ve been feeling very stagnant in life. The Significance of Movement hit me one morning when I started realizing how monotony and lack of motion can affect your state of being both mentally and physically. I was quickly able to relate that to how we have come to impart animation and movement digitally to convey ideas and present details to keep things exciting and fluid. We strive for things to feel natural in the digital world. So, all natural physics based functions like gravity, collisions, and boundaries move our digital interfaces closer to reality making us feel more comfortable with it. UIKit Dynamics is pretty much an entire physics engine for UIKit which enables us to do these things. Subtle motion, mass to objects and a tiny tug-pull here and there make us feel closer to the interface because of the realism portrayed in it. UIKit comes bundled with UIKit Dynamics which assists us in delivering experiences that are closer to the natural world using physics. Let’s look at the fundamentals of UIKit dynamics and how to work with the basic classes that it offers. UIKitDynamicAnimator is the boss class that manages and orchestrates the animations in a view. It takes a referenceView where the animations will take place. It’s as simple as that. Let’s look at an example of the Gravity Behavior to understand how behaviors work. To understand gravity behavior, let’s build a simple square which will fall from where it’s placed due to gravity behavior. Now that we have an animator we could use to perform dynamic animations, we could go on to add behaviors to the animator. But before that, let’s add a box on which we will see how the gravity behavior works. It’s important to understand that Behaviors are bound to items and can be added to an animator. Items are objects that implement the UIDynamicItem protocol. The UIView and UICollectionViewLayoutAttributes implement this protocol already, so simply by using UIViews as our items, we are able to bind it to behaviors. Doing this, we see how the box starts to fall down because of the gravity behavior that we’ve just added. We now see how the gravity behavior makes the square fall indefinitely. It would be nice if it could consider the bottom of the screen as a floor, wouldn’t it? Collision Behaviors help us define how objects interact with each other. This kind of sounds like what we need at the moment. By defining a collision behavior, we could define a boundary around each item the object is associated with. Since our box is going to function inside of our reference view boundaries, there’s a handy property on collision behavior object called translatesReferenceBoundsIntoBoundary which when set to true, takes care of setting our view’s bounds as the boundary for the behavior. Handy, isn’t it? There are a lot more behaviors that we could take advantage of to write intuitive and exciting apps. What’s the fun in making a box fall, you ask? Say no more. Let’s put what we’ve learned to good use by building a UI. Here we use a pan gesture to implement dragging on the card, by getting the current translation in view and using the translation to set the card’s position as the finger is dragged. 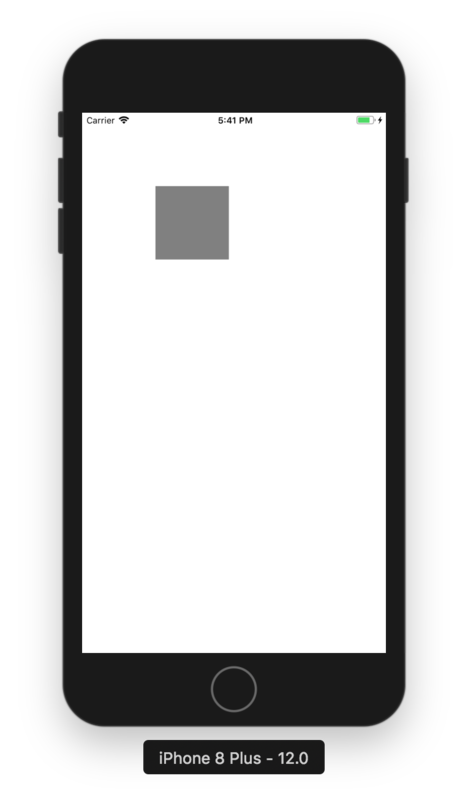 The pan(recognizer:) is called continuously with the state .changed when the finger is dragged across the screen which changes the card’s position continuously. Now that we have a draggable view, let’s move on to building the snap behavior. We’ll use the UISnapBehavior class to implement this. To begin with, we will declare an animator property like earlier in the class and initialize it with the primary view in the viewDidLoad method. @IBOutlet weak var card: UIView! This is a primer to get someone with no prior experience in UIKit Dynamics off the ground and doesn’t cover all of what UIKit Dynamics is capable of. I highly recommend going through Apple’s Developer documentation on the subject and playing with all kinds of behaviors to fully appreciate what UIKit Dynamics can do. All kinds of feedback and questions are welcome. Thanks to Raul's article on UIKit Dynamics where his approach to explaining UISnapBehavior is on point, which I have borrowed.